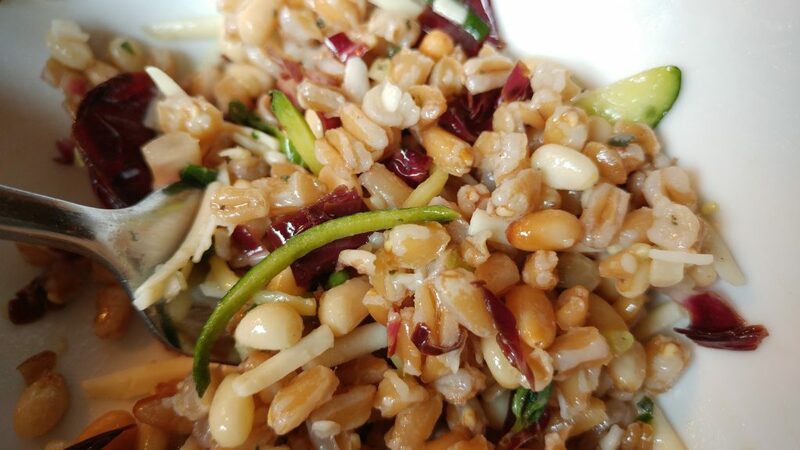 Like my close-up shot here giving you detail of this salad down to every grain of farro? It’s not me trying to be arty or stylish. It was the simple matter of the fact that I’d gotten down to the last few bites left in the bowl before I realized I might want to capture it before all was gone. After my first bite a bit earlier I’d thought to myself, hmmmm, this is pretty good. (Particularly since it was leftovers from dinner a couple nights earlier.) I continued eating, getting engrossed in whatever work I was doing. About halfway through the bowl, I perked up again. Really good. Everything held up very well, it made a good quick-dinner option on a hot night, but clearly holds up well, solid option for picnicking or any other do-ahead scenario. Flavorful, healthy, easy. That’s when I bunched up what little was left and took a snap. And why I decided to recreate those steps to share, so you might add it to your no-fuss, hot-weather meal options. First off, we knew the coming week was going to be hot. Extra hot. I just read that we broke the record for the high low-temperature-of-the-day, one day never dipped below 69 degrees in the course of 24 hours. Highs in the low 90s this week. For Seattle, that’s HOT. Minimal cooking, maximum light-but-filling fare was the way to go. I perused the stock on hand to find likely candidates: farro, pine nuts, random cheese in the fridge (I think they were manchego and Gruyère that I used). Always Dijon, olive oil and various vinegars to rely on. I’d grabbed a bunch of vegetables at the store, some destined for the next night’s chop salad, so this left me with zucchini and radicchio. And the garden has herbs-a-plenty to choose from. ♦ Cooked the farro with fresh bay leaf and a whole garlic clove or two added to the water. Package instructions, maybe 20 minutes or so. Got about 2 cups cooked. ♦ Grated the cheeses, coarsely on a box grater. Probably a generous cup or so combined. ♦ Used a handy slicer with its julienne blade to cut 2 small zucchini. ♦ Cut half a medium head of radicchio crosswise into thin slivers. ♦ Plucked a bunch of thyme from the garden, chopping leaves to get a generous couple teaspoons. Which I tossed into a simple vinaigrette using sherry vinegar, with a dab of Dijon and a good pinch each of salt and pepper. That’s pretty much it. Toss everything in a big bowl. If it can sit for 15 to 30 minutes before serving, getting tossed once or twice, flavors will be a little more developed. This template allows plenty of room for tweaks. Many other grains/legumes should work great, I nearly did this with green lentils, surely anything from white rice to canned chickpeas would be fine. Other cheeses can be used but I’d stick with hard cheese (Parmesan, aged Gouda), whose firm texture will work best in this salad. Red or white wine vinegar can swap with the sherry vinaigrette in the dressing. Rosemary, parsley and/or oregano for the herbal component. I hope that if you’re trying to beat the heat now too, it’s with something delicious that doesn’t keep you in the kitchen long. With so much great produce available this time of year, and taking advantage of a few staple ingredients on hand, it’s a fun time to revel in ad-lib cooking.